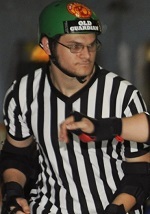 Red Stick Roller Derby | August’s Referee of the Month: Just David! ← August’s Capital Defender of the Month: Lap Lacian! August’s Referee of the Month: Just David! Nicknames are terms of endearment. Mine was given to me and I wear it proudly. I enjoy the friendly community between everybody. It’s kind of like a family. I am friends with Jewels Burn. One day she asked me to be a NSO (Non-Skating Official) at one of the bouts because they were short on volunteers. One game turned into two, and two to three. At the after party she joked that I should just go ahead and be a ref. So I did. I have improved my balance quite a bit. What are your goals as a referee? I want to be a fair and balanced ref. The most memorable moment would be the game I ref’d where I kept getting taken out by the players flying off the track. The kind that works how it’s supposed to. I don’t know the different companies. Do you have a favorite song to skate to or a theme song? I prefer upbeat songs that keep me in a rhythm. I enjoy the Red Stick cheer. It’s short, simple, and draws the crowd into unison. Just David doing his part to keep the skaters legal and safe. If you could arm wrestle any person in the league, who would you arm wrestle and why? Challenging someone to arm wrestling would imply I could actually beat a derby girl at arm wrestling. Is there a teammate with whom you work the best? I work well with all of the zebras. What sports did you play before you laced up the quads and took to the flat track? Before derby I hadn’t play any sports since middle school, unless you consider the SCA (Society for Creative Anachronism) a sport. I do an assortment of hobbies including blacksmithing, medieval reenactment, and playing on my computer. Do you have any advice to anyone thinking about taking up derby? 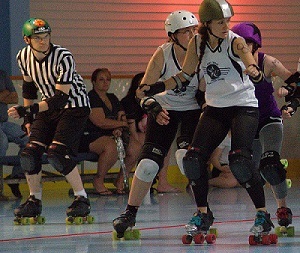 When did you join Red Stick Roller Derby? I joined a fresh meat class that began in August 2012. I have been a part of derby for a little over a year now.